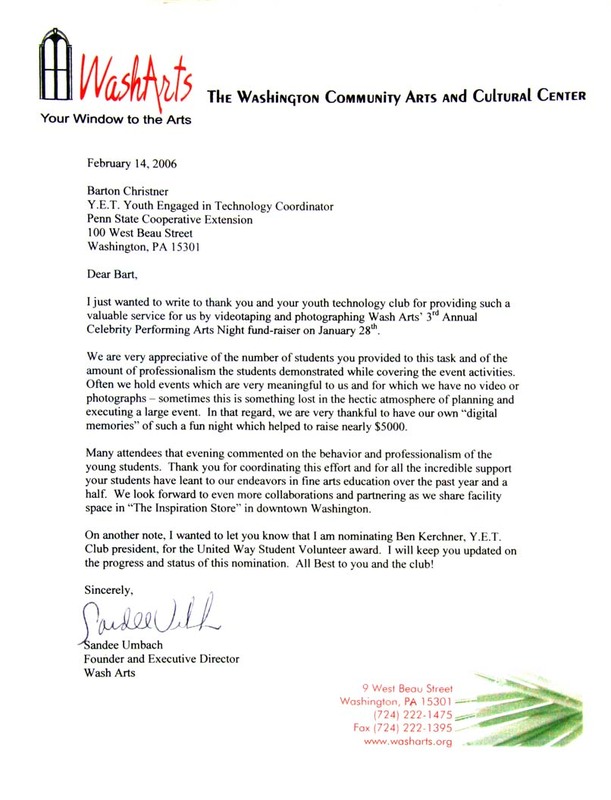 I just want to write to thank you and your [Youth Engaged in Technology] club for providing such a valuable service for us by videotaping and photographing Wash Arts' 3rd Annual Celebrity Performing Arts Night fund-raiser on January 28th. We are very appreciative of the number of students you provided to this task and of the amount of professionalism the students demonstrated while covering the event activities. Often we hold events which are very meaningful to us and for which we have no video or photogrphs - sometimes this is something lost in the hectic atmosphere of planning and executing a large event. In that regard, we are very thankful to have our own "digital memories" of such a fun night which helped to raise nearly $5000. Many attendees that evening commented on the behavior and professionalism of the young students. Thank you for coordinating this effortand for all the incredible support your students have leant to our endeavors in fine arts education over the past year and a half. We look forward to even more collaborations and partnering as we share facility space in "The Inspiration Store" in downtown Washington. On another note, I wanted to let you know I am nominating Ben Kerchner, Y.E.T. Club President, for the United Way Student Volunteer award. I will keep you updated on the progress and status of this nomination. All Best to you and the club!